Despite the fact that it arrives in June, word on Pixar’s tentpole Toy Story 4 has been curiously scarce. 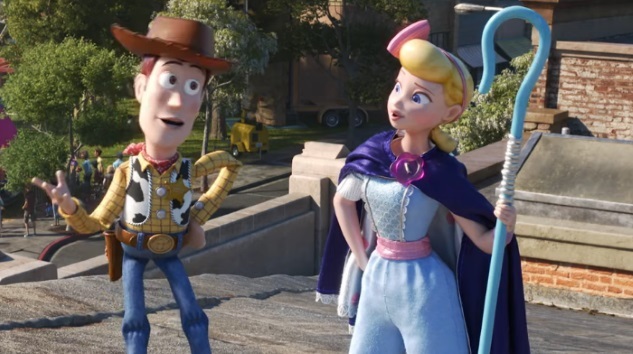 Now, however, we have our first actual (albeit short) look at some of its characters in motion, and the Super Bowl ad includes the return of Woody’s lost love: Bo Peep. As in the first and second films (Peep was absent in Toy Story 3), she’s played by Annie Potts of Ghostbusters fame. The action in the teaser seems to take place at a carnival of sorts, where Buzz Lightyear has simultaneously been imprisoned as a prize in a crooked game of chance. We also get introduced to the duo of characters portrayed by Keegan-Michael Key and Jordan Peele, who are known as “Ducky” and “Bunny” respectively. As for the bigger picture on the story of Toy Story 4, the most detailed synopsis seems to be the one below. It references Bonnie, the young girl who has adopted our protagonist toys after original owner Andy went off to college. Woody has always been confident about his place in the world, and that his priority is taking care of his owner, whether that is Andy or Bonnie. So when Bonnie’s beloved new craft-project-turned-toy, Forky (voice of Tony Hale), declares himself as “trash” and not a toy, Woody takes it upon himself to show Forky why he should embrace being a toy. But when Bonnie takes the whole gang on her family’s road trip excursion, Woody ends up on an unexpected detour that includes a reunion with his long-lost girlfriend Bo Peep (voice of Annie Potts). After years of being on her own, Bo’s adventurous spirit and life on the road belie her delicate porcelain exterior. As Woody and Bo realize they are worlds apart when it comes to life as a toy, they soon come to find that is the least of their worries. So there you have it. Toy Story 4 hits theaters on June 21, 2019. Witness the return of Bo Peep below, and the debut of Ducky and Bunny.